Pink and Fabulous: Giveaway: Love Yourself Valentine! Happy Valentine's Day week! Whether or not this holiday makes you all gaga eyed or totally bitter (trust me, I have been both!) it is always a great reason to LOVE YOU! I mean, what better what to do that than to treat yourself? 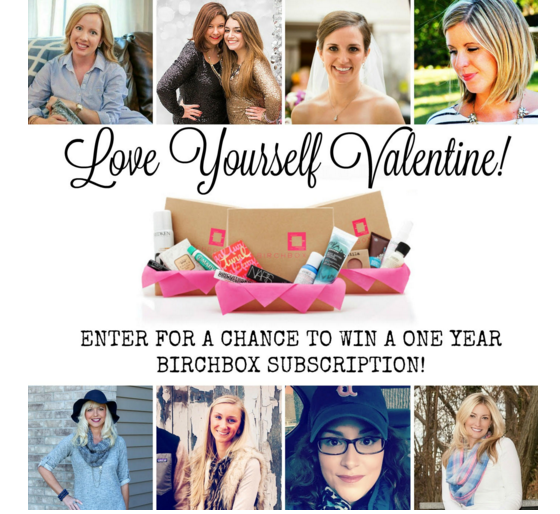 I'm linking up with a bunch of fabulous ladies to giveaway a year's subscription to BirchBox! The giveaway starts today and runs through the 12th. Enter below! Hosted by: Jessi's Design, The Sequin Notebook, Going The Distance, Pink and Fabulous, Living On Cloud Nine, Lisa Loves John, Twin Living Blog and A Little Glitter. I love the idea of this giveaway!!!! Fingers crossed! I don't have any Valentine's day plans. I will be making dinner for my family, and then spend a quiet night with hubby afterwards. My Husband is taking me and the dog away for a weekend at the beach, we are really looking forward to it.